This board is a compact (0.5″ × 0.8″) breakout board for ST’s LSM303DLHC 3-axis accelerometer and 3-axis magnetometer; we therefore recommend careful reading of the LSM303DLHC datasheet (629k pdf) before using this product. The LSM303DLHC is a great IC, but its small package makes it difficult for the typical student or hobbyist to use. It also operates at voltages below 3.6 V, which can make interfacing difficult for microcontrollers operating at 5 V. This carrier board addresses these issues by incorporating additional electronics, including a 3.3 V voltage regulator and level-shifting circuits, while keeping the overall size as compact as possible. The board ships fully populated with its SMD components, including the LSM303, as shown in the product picture. Compared to the LSM303DLH and LSM303DLM used on our original compass and accelerometer carrier boards, the LSM303DLHC features improved magnetic sensing resolution and a wider acceleration measurement range (±2g to ±16g). This LSM303DLHC carrier is 0.1″ shorter than the earlier boards while remaining pin-compatible, although changes in I²C addresses and configuration registers mean that code written to interface with an LSM303DLH or LSM303DLM might need to be modified to work with an LSM303DLHC. The LSM303 has many configurable options, including dynamically selectable sensitivities for the accelerometer and magnetometer, a choice of output data rates, and two independently-programmable external inertial interrupt pins. The magnetometer and accelerometer can be individually turned on and off to save power. The six independent magnetic and acceleration readings (sometimes called 6DOF) are available through an I²C/TWI interface and can be used for many applications, including making a tilt-compensated compass that can be used to determine headings regardless of how the board is inclined (ST provides an application note(1MB pdf) that explains the details of making one). 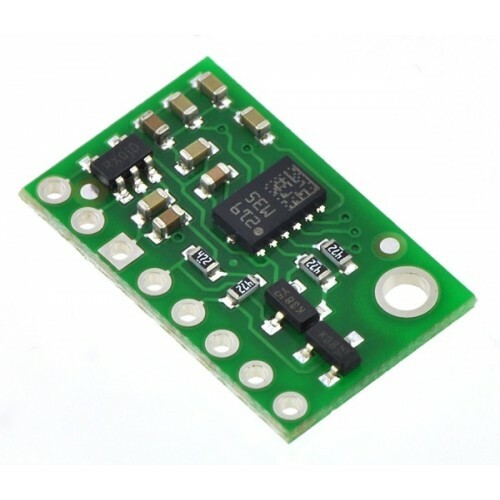 The carrier board includes a low-dropout linear voltage regulator that provides the 3.3 V required by the LSM303, which allows the sensor to be powered from a 2.5–5.5 V supply. The regulator output is available on the VDD pin and can supply almost 150 mA to external devices. The breakout board also includes a circuit that shifts the I²C clock and data lines to the same logic voltage level as the supplied VIN, making it simple to interface the board with 5 V systems, and the board’s 0.1″ pin spacing makes it easy to use with standard solderless breadboards and 0.1″ perfboards. For sensor fusion applications, our MinIMU-9 v2 inertial measurement unit combines the LSM303DLHC with an L3GD20 3-axis gyro on a board the same size as this LSM303DLHC carrier, providing nine independent readings that can be used to calculate an absolute orientation. An 8×1 strip of 0.1″ header pins and an 8×1 strip of 0.1″ right-angle header pins are included, as shown in the picture below. You can solder the header strip of your choice to the board for use with custom cables or solderless breadboards, or you can solder wires directly to the board itself for more compact installations. The LSM303DLHC readings can be queried and the device can be configured through the I²C bus. The module acts as two chained I²C slave devices, with the accelerometer and magnetometer clock and data lines tied together to the same I²C bus to ease communication. Additionally, level shifters on the I²C clock (SCL) and data lines (SDA) enable I²C communication with microcontrollers operating at the same voltage as VIN (2.5–5.5V). A detailed explanation of the protocol can be found in the LSM303DLHC datasheet (629k pdf), and more detailed information about I²C in general can be found in NXP’s I²C-bus specification (371k pdf). The accelerometer and the magnetometer have separate 7-bit slave addresses on the I²C bus. The magnetometer’s slave address is fixed to 0011110b and the accelerometer’s slave address is fixed to 0011001b. mbed: There is a library for using the similar LSM303DLH with the ARM mbed development board. This library was not written and is not maintained by Pololu, and it needs to be modified slightly to work with the LSM303DLHC. The magnetometer will not update its data until all 6 data bytes have been read during a single I²C transfer. All the bytes can be read in the same transfer using the magnetometer’s automatic subaddress updating feature (this feature is enabled by default). The accelerometer and magnetometer combined in this IC originate from different manufacturers, so there are fairly significant differences in their features, functionality, and interfaces.